A small opening; a small pit or depression; a small blank space; a gap or vacancy; a hiatus. An absent part, especially in a book or other piece of writing, often referring to an ancient manuscript or similar such. e.g. "Long lacunae in this inscription make interpretation difficult." (microscopy) A space visible between cells, allowing free passage of light. I dwelled upon the accidents that allow some information to survive, allowing us to piece together the past, while much is lost. We can never know everything about history. I wonder, what exactly is in those voids where there is no information. We draw conclusions based on what we have and what we know; we also may draw conclusions based on how we wish the world would be. There’s also a pervading sense that there is nothing we can’t know. That all knowledge belongs to us, should we choose to access it. In what circumstances is it possible to admit there is not enough information available to draw any conclusions? The term "lacuna" is sometimes used in research to describe exactly this void; but in my opinion it could be used much more often: how do you know what you do not know? Who decides what gets preserved and carried forward to inform our world today? I imagine it is connected with wealth and/or power - that those would have the means, influence, and physical resources to preserve material which otherwise would have been lost to the elements. I think about this often with art history, about what kind of drawings might have been on fragile papers that were lost and destroyed due to all kinds of circumstances. There are still quite a few posters that I have yet to research, so I am presenting them here for the viewer to conduct their own unique research, and decide themselves what might be interesting or significant about the content of these posters. Click or tap on image to view in full. 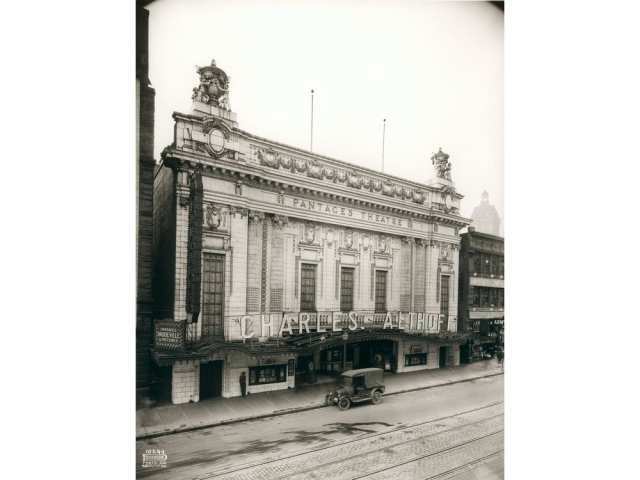 In 1927, there were theatres everywhere that showed a variety of entertainment, plays and Vaudeville - although Vaudeville was beginning to take its last breath in the late 20s. 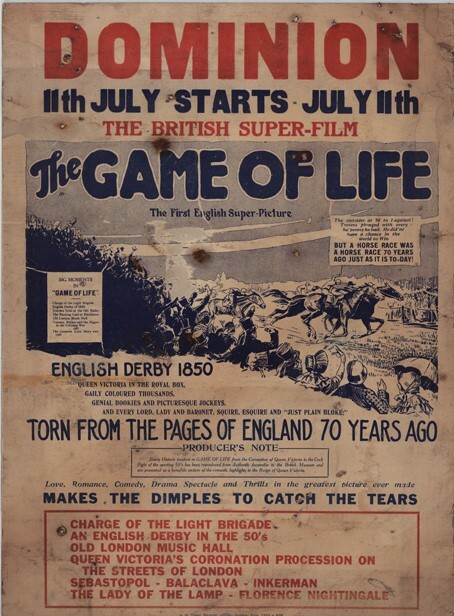 The Dominion theatre showed silent films, and the posters show an interest in British films. It was built in 1911, located in the 900 block of Granville Street. It was extensively renovated with only the frame of the building remaining, which now houses the Caprice Nightclub (recently closed). The ceiling inside was a marvelous glass and mirrored ceiling, as shown in the photo above. 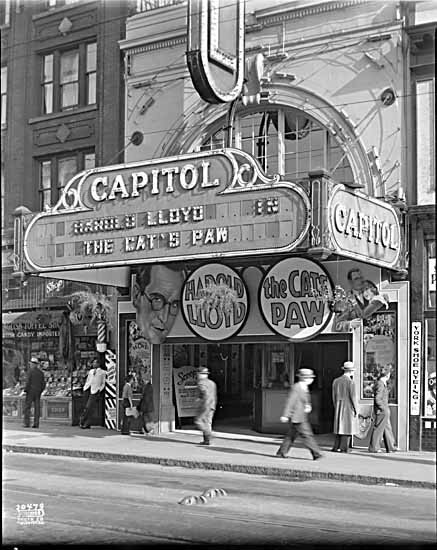 The Capitol Theatre was located at 820 Granville, and it opened in 1921. In 1977 the building was rebuilt as a multi-plex cinema, but that has been completely replaced by the patchwork of mall, business, and residential buildings in that location. 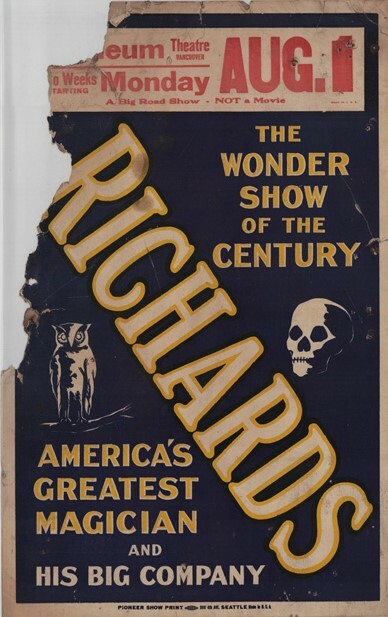 The second Orpheum Theatre opened in November of 1927, after the estimated date of these found posters. 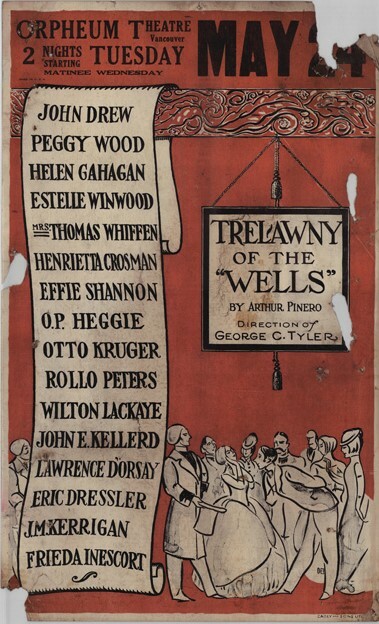 Therefore, the poster above advertising the "Trelawny of the Wells" would have been for the first Orpheum. It was located at 761 Granville, and in 1969 it was demolished to begin creating the Pacific Centre. I was reflecting on the loss of these theatres, that the buildings weren't preserved, and today there is a chance to save a theatre from demolition with the Rio Theatre. The fundraising battle is currently being waged, and I hope they get enough support so it can continue to be a community hub, an independent theatre. If you're interested in learning more and helping out, check out http://riotheatre.ca/save-the-rio/ I hope it can be saved, and in the future someone like myself would have a different experience of researching. I also wonder why most of these theatres weren't saved or preserved in the 60's, 70's, 80's, and so on. Why didn't people put up a bigger fight, or why wasn't the historical value recognized? Is it because there were so many theatres and venues for all kinds of entertainment, that if one was lost, it didn't seem like a big deal? The Rio is a unique place in Vancouver today. People are fighting for it. 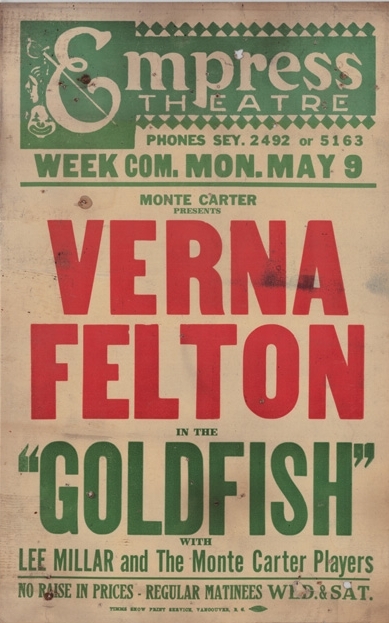 This week in my research I found out all about Verna Felton, whose name is found on three of the five Empress Theatre posters. Sidenote: the Empress showed mainly live stage productions in the 1920's, and I found it interesting that all of the plays at the Empress had previously been shown elsewhere as films - and the films were adapted from even older original plays. 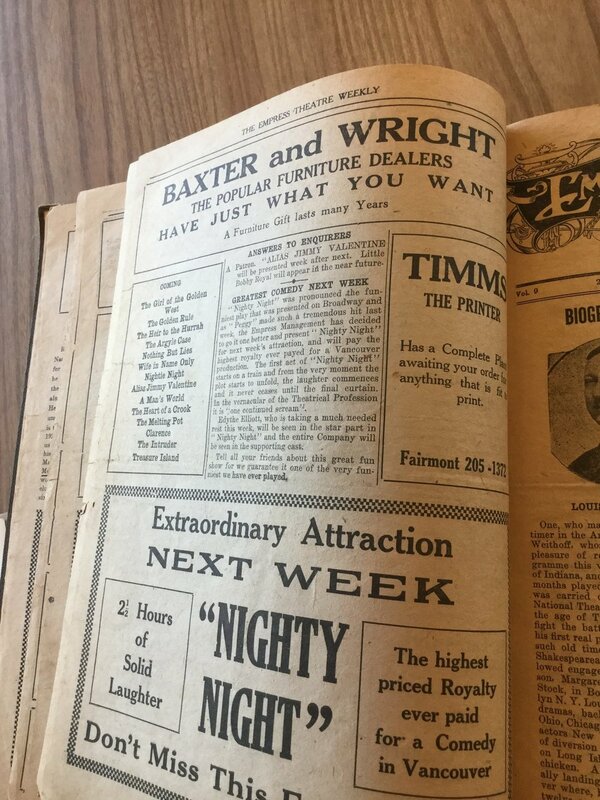 This funny flip-flopping of stories between plays and films is indicative of the tumultuous nature of film entering the entertainment scene from the early 1910's to the 30's, when it became much more established. 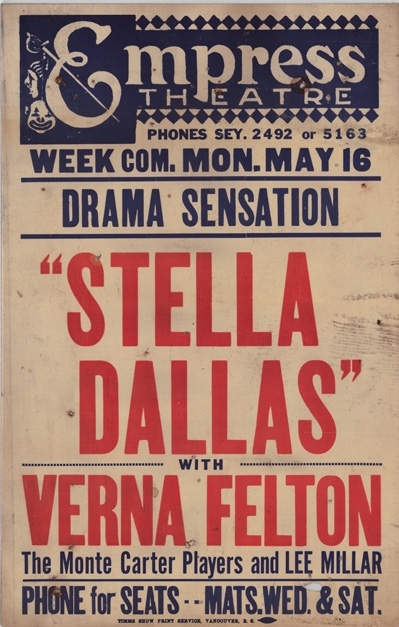 Lobby Card for Silent Film "Stella Dallas"
Still from 1926 film "The Goldfish"
Still from 1916 silent film "The Second Mrs. Tanqueray"
Verna Felton may not be a household name today, but many may recognize her voice: in the 30's, 40's, and 50's she voiced a number of mother or grandmother-like Disney characters, including the Fairy Godmother in Cinderella (1950), the Queen of Hearts in Alice in Wonderland (1951), and a host of strong, kindly, or authoritative feminine roles. 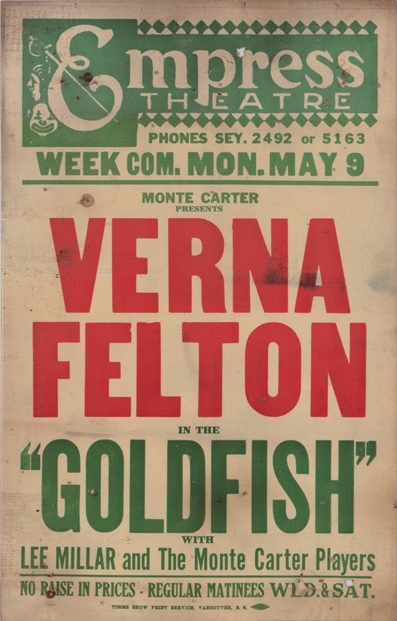 The earliest record of Verna Felton, a 1901 sheet music book for a musical comedy. She is 11 years old in the photo above! 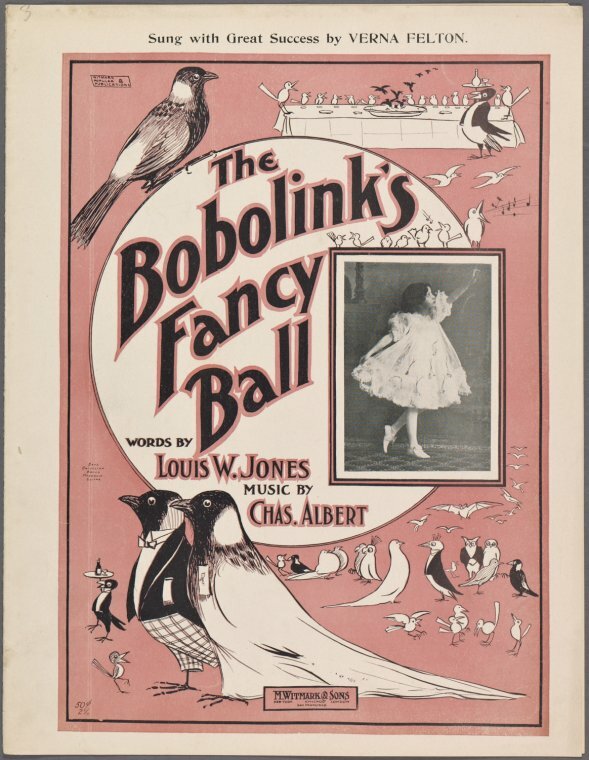 from New York Public Library Digital Collections. 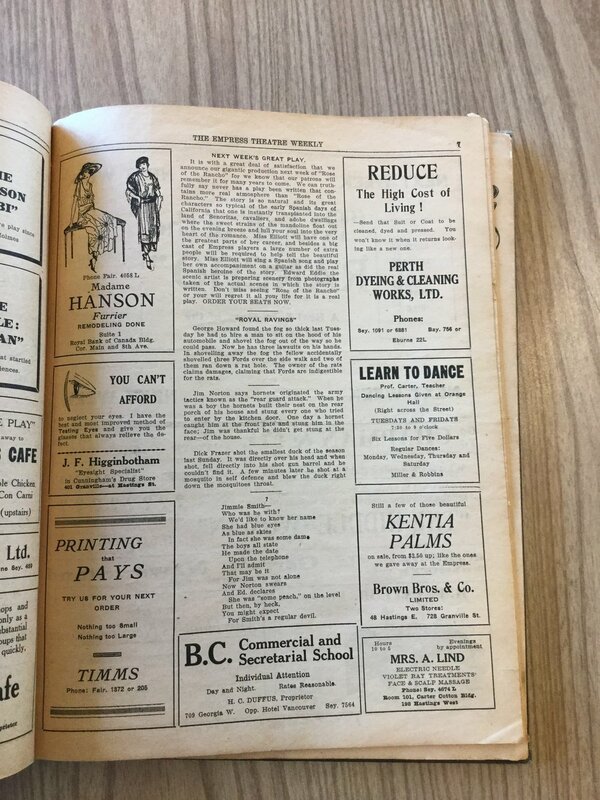 From the 1925 article in the Edmonton Metropolitan Theatre programme below, it gives us a clue to Verna Felton's stage performances. 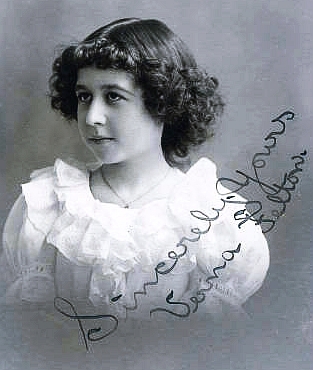 The review is absolutely positive, describing Verna as "a young lady, who by her quaint idiosyncracies and genuine feminine qualities, greatly endeared herself to the Monday evening's audience" in the play Sis Hopkins. They also say "A less accomplished player in the part would have been ridiculous, but Miss Felton came away with flying colours." Verna was an understated comedian with an unbeatable deadpan expression. In looking at all the photos of her throughout her life there seems to be a light in her eyes that never changes. Since Verna was in her 60's when she starting television, she played on a huge variety of shows, always as a character actress, rarely in anything beyond a supporting role. Yet she inhabited these roles fully, filling the screen with well-placed humour. In the video below, an appearance by Verna on the Ray Bolger Show, she is almost 70 years old, yet stomps and spins as well as her younger dance partner! Note she introduces the clip with an invitation to go back to the 1920's, the same era the Empress posters are from. Be sure to wait for her reappearance at 1:40 into the clip. This poster from beneath the Blue Cabin floorboards advertises a historical match between Gene Tunney and Jack Dempsey, when Tunney took the heavyweight title. The film advertised on the poster contains one of the most famous moments in boxing history, known as "the Long Count Fight" between Jack Dempsey and Gene Tunney in Chicago. In the video below, during Round 7 (beginning at 3:10) Tunney remains on the canvas for an extended count, due to the ref not beginning the official count until Dempsey has retreated to a neutral corner of the ring. The neutral corner rule was relatively new to the boxing championship rules, but was agreed upon by all fighters prior to the fight. Dempsey seems to require a few reminders from the ref to retreat. All in all one of the most interesting moments in boxing at the time! Visit THE FIGHT FILM COLLECTOR blog for rare boxing films exclusively from a private 16mm collection. 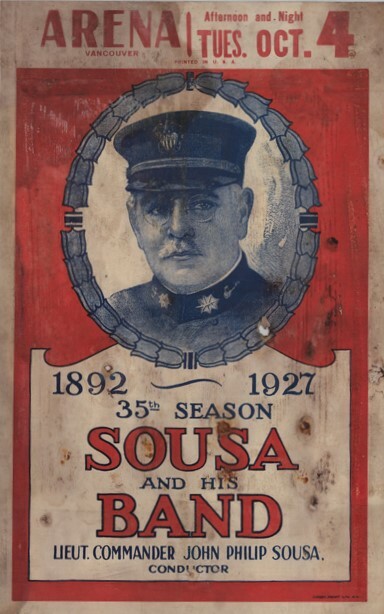 It is difficult to determine if the film shown above was the same footage that would have been shown at the Pantages in 1927, as that fight at the Soldiers' Field in Chicago was recorded by many commercial film crews. Also difficult to determine is which Pantages Theatre might have shown the film, although evidence points to the second Pantages in Vancouver, built at 20 West Hastings from 1914-18. It later became the Majestic theatre, then the Odeon. The second Pantages, at 20 West Hastings. Courtesy City Vancouver Archives. Unfortunately, this building was demolished in 1967 and become a parking lot. A photo of the demolition of the Pantages Theatre - with two workers taking a break on the middle ledge. Photo credit: Vancouver Public Library Archives. The original Pantages was a theatre built specifically for Vaudeville shows, and showed many more live shows than screened films. 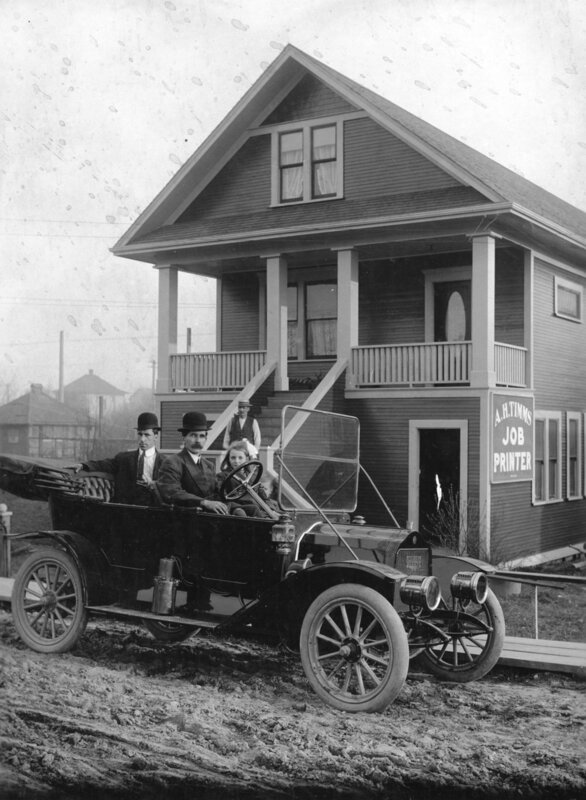 It was built in 1907 and stood at 152 East Hastings St. There was a valiant fight by citizens of Vancouver to save the beautiful old red-brick building from demolition, but in 2011 it was demolished after the roof collapsed. A small reminder to preserve the heritage around us whenever possible, before it becomes too late. In thinking about the posters as material beings, I've been thinking a lot about what they might have heard; the sound that travelled to them as they lived in the dark under the floorboards of the cabin. Although it isn't an accurate representation, as the cabin and its landscape have changed so much, it has been tangentially fascinating to explore the sonic qualities of the cabin and the site on the beach. The following sound clips are best listened to with headphones and, like most sound pieces, without distractions. it's quiet inside the cabin, the outdoor sound barely enters through the wooden walls - but opening the door lets the air and sound rush in. a description from memory of how the cabin was nestled into the landscape. 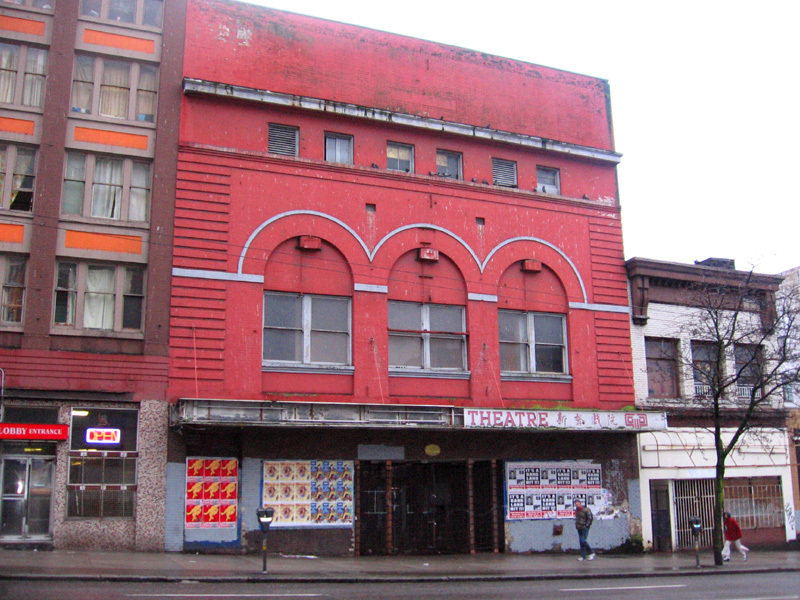 I researched the Empress Theatre which stood at Gore and Hastings in Chinatown. It was built in 1908 and demolished in 1940 (info from Changing Vancouver blog). 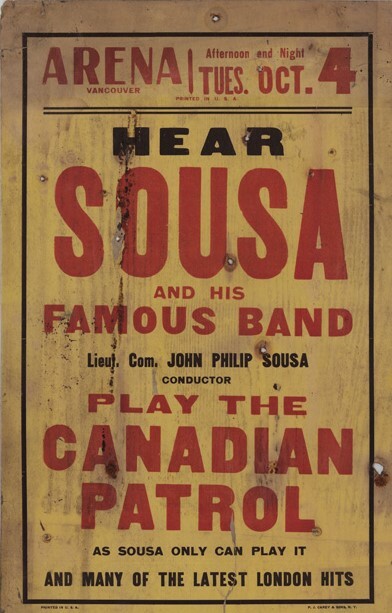 There were several posters found under the floorboards of the blue cabin which advertise the Empress Theatre. I've deduced that these shows date from 1927, and the following four posters are all from the same year. 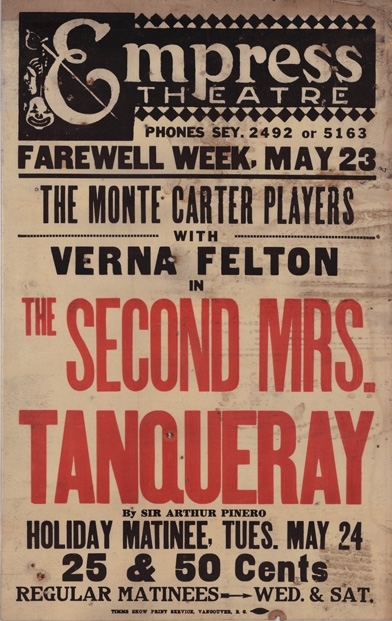 That means in May, the Empress was showing a play per week - even two! 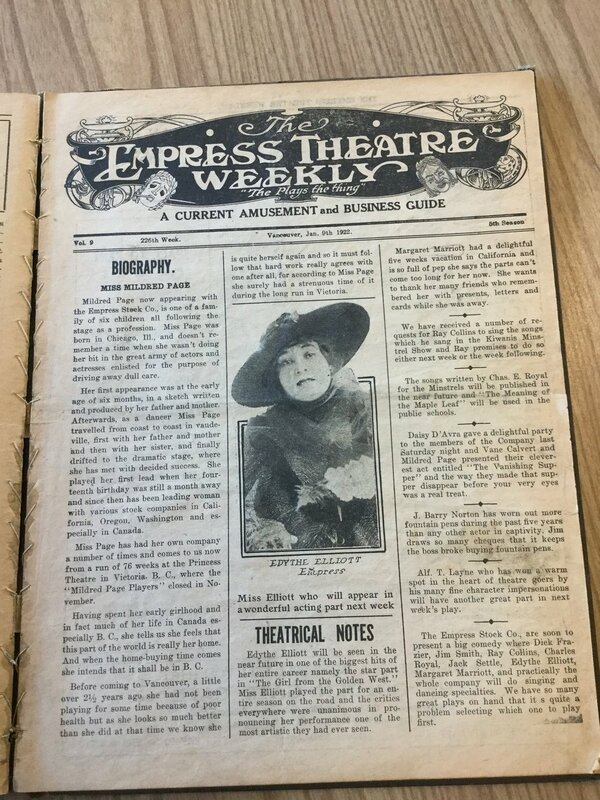 At the City of Vancouver Archives, they have some pamphlets and newsletters published by the Empress. 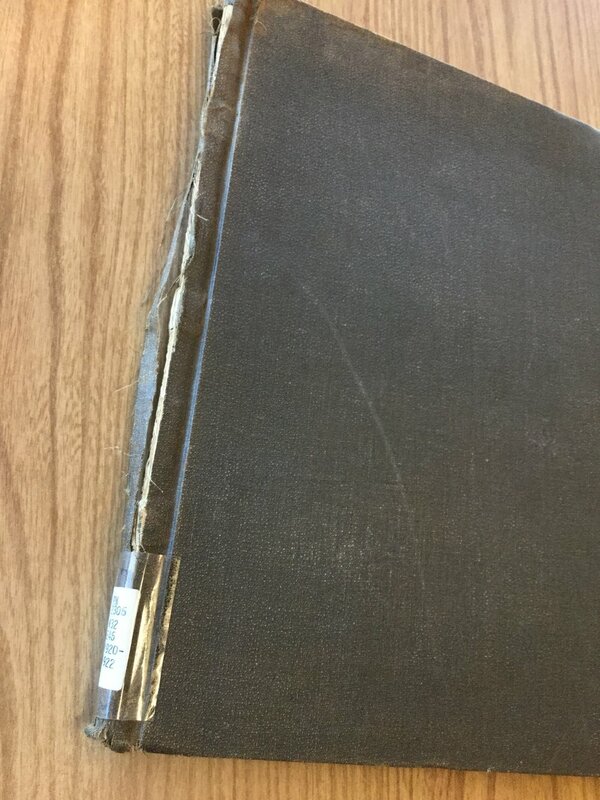 This is a stack of weekly newsletters from the Empress Theatre bound into a single book which seems very old! On the page above, you can see all the "answers to enquiries" which readers had written in. You can also see an ad for the Orpheum Theatre, which might have been somewhat of a rival theatre in the same neighbourhood. I also noticed quite a few ads for political candidates which stressed "sane" and/or "logical" leadership, language which would seem strange today. I have recently had the honour of beginning an internship at the grunt gallery, where the parameters of my work there involved working with posters discovered under the floorboards of the Blue Cabin during its restoration by Jeremy + Sus Borsos. At first I had many, many thoughts about these posters, mostly philosophical thoughts about their tactile existence. And many of the ideas I had about working with them were more tangible, conceptual, performative in nature. 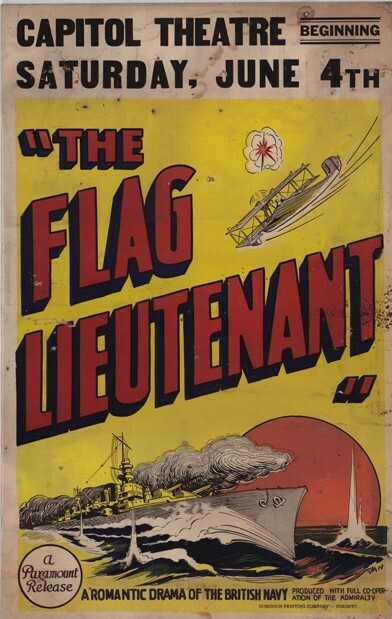 But, curiosity about the content of the posters is beginning to drive a research based exploration for me - and the labour of trying to dig up anything that connects these posters to history also accomplishes my goal, of giving attention and care to that which is unknown. It feels like the posters themselves - in their physical form - are sort of abject, unwanted. (thought sprung from the one poster that even said “the unwanted”) When they were put in the floor, they weren’t chosen for the content, they were treated as scrap paper. And even today, the theaters and places they came from, weren’t really interested in having them. Maybe the posters could go into the walls of whatever condos they are building, the development that forced the cabin to be moved. Become invisible again. Back into a vault. Exist, yet not in public space. Really fascinated with that whole space between high and low tide, interstitial, neither this nor that - interstitial can also mean the spaces in architecture between walls, so very nice parallel there. Reprint posters and wheatpaste around town as though original event is occurring again. Maybe perform the event? Or a rendition of it? Have a listening party, in the presence of the posters - although, oddly enough, the posters would have never been present at the event they advertised. I’m still ruminating on the idea of the posters as a utilitarian object - food for silverfish and burrows for mice who lived there, put there by the builder of the cabin. Maybe they were actually precious to the builder, who put them there thinking, "this way I'll always know where they are"?